How is it possible that people living in the same household don’t always fall ill when someone in the family is sick? How can medical doctors and nurses work in hospitals and not be sick all the time? What about teachers working with little booger-pickers all day? If germs caused disease than wouldn’t all of these people be sick? In fact, germs don’t cause disease, weakened immune systems do. That is the only plausible explanation. When someone in the family gets the flu, there is no doubt that everyone living in the household has been infected by the virus. The only question at that point is whether or not their immune systems can battle the virus effectively. A year into my doctorate program, a very virulent strain of the flu was making its way across the country. It was all over the news being touted as an epidemic. The first year of the doctorate program was extremely demanding as I was learning the “new language” of advanced sciences. Needless to say my nose was in a book so often I was completely oblivious to what was going on in the real world. My daughter came home from school one Friday in the midst of the epidemic, and she said that there were only five kids in her class that day because everyone was out sick with the flu. That means that 80% of the kids in her class had not been able to fight off the virus. I asked her if she knew whether any of the kids that were sick had received the flu shot? She said that the teacher had actually mentioned how surprised she was that many of the kids that fell ill had received the flu shot, while 3/5 of the kids that didn’t fall ill did not get the shot (including my daughter). I was not surprised that she didn’t get sick; she gets adjusted every week, which boosts her immune system! My dad was listening in on the conversation and he asked what percentage of my class had caught the flu. This is when the light bulb really went off in my head. When I thought about it, I could only recall 1-2 people being sick in the past month, out of a class of 70+ people! When compared to my daughter’s class it was an overwhelming statistic. I could only come to the conclusion that I was witnessing the power of the chiropractic lifestyle, which trumps a flu shot any day of the week, without the potentially harmful side effects. Health comes from the inside out, not the other way around. 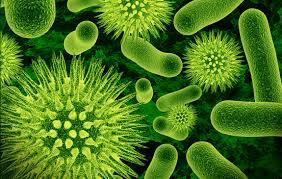 Conventional wisdom states that bacteria cause disease and should be eliminated. This mindset is evident by the overuse of antibiotics and antibacterial soap in our society. We have declared war on bacteria. The bacteria are beginning to fight back with antibiotic resistant strains like MSRA. I propose a shift in thinking, a peace treaty if you will. Bacteria have been here longer than us. Much longer. The first eukaryotic cells appeared 1.8 billion years ago, around the time that oxygen was becoming plentiful in the atmosphere. Since then they have not only survived, but thrived. Just recently humankind has begun this egotistical approach of attempting to “fight” bacteria. Bacteria do not cause disease. Weakened immune systems allow disease to take hold. I can take a swab with a q-tip right now on the side of your face and culture numerous “harmful” bacteria including S. aureus, S. epidermitis, etc. These bacteria are EVERYWHERE! So why aren’t we all dying from sepsis, endocarditis, or meningitis? Because our immune systems are doing their jobs day in and day out. We will never eliminate all of the bacteria from our lives. Nor should we. Every bacterium is there for a reason and serves a specific purpose, which we may or may not understand at this point. Waging war on bacteria is a loser’s game and I refuse to participate. Throw away your antibacterial soap and reserve antibiotic use for serious emergencies only. Probiotics, chiropractic care, and other preventative measures should be the focus of modern scientific research. We should strive to find ways to support beneficial bacteria and boost our immune system. Living in harmony with bacteria is the only winning approach for survival of our species. Boosting our immune systems through optimal nervous system function is the way to go. Let me explain how this relates to chiropractic. Chiropractic care has been proven to boost immune function in multiple studies. Increased serum thiol levels, decreased antibiotic use, and decreased hospital visits have all been attributed to the cumulative preventative effect that long term chiropractic care has on people. How does this relate to bacteria, probiotics, etc.? Good question. The nervous system is the master controller of all of the body’s functions. The vagus nerve in particular has been shown to play a vital role in natural immunity. The chiropractic adjustment stimulates the vagus nerve! If your brain is able to send clear messages to your gastrointestinal tract the beneficial bacteria work hard and remain happy. Now I’m not saying to never wash your hands again or to drink directly out of a stream. Sanitation is important. However, this war on bacteria has reached its tipping point and it is time to adopt an approach that is more reasonable and more sustainable. First and foremost make sure your nervous system is functioning properly; this will allow the beneficial bacteria to do their job. Secondly you should consider a daily probiotic to repopulate your gut with good flora. Last and not least eat plenty of whole foods, which good bacteria love!